Milan’s Piazza Belgioiso is a pretty oasis of respite in the middle of the city’s bustling downtown. As is Boeucc, one of Milan’s historic dining destinations. 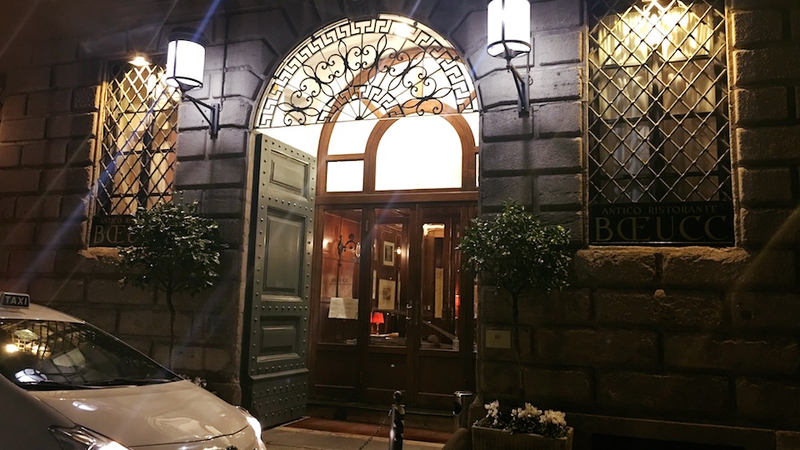 Housed in the Belgioioso palazzo, Boeucc was founded in 1696 as small traveller’s inn located between via Durini and via Borgogna. Everything about Boeucc – the elegant interior, the wood paneled walls, the imposing lamps, the linen tablecloths, the silver cutlery, the uniformed waiters, and the very traditional and well rendered cuisine – all harken back to a golden age when life seemed less harried, less needlessly complex, less vulgar. Unfortunately, another thing that will also remind diners of a different time is the wine service, which was once haphazard (actually not that long ago) in many Italian restaurants. Boeucc’s dining rooms are very brightly lit and spacious, with a seating arrangement that allows patrons a good deal of privacy. The menu is replete with classic Milanese dishes, including ossobuco, risotto alla Milanese, risotto with frogs’ legs, nervetti salad, veal chop Milanese-style (cotoletta alla Milanese) and many others. Everything I have ever eaten at Boeucc has always been very well cooked and flavorful. My last meal was no different. 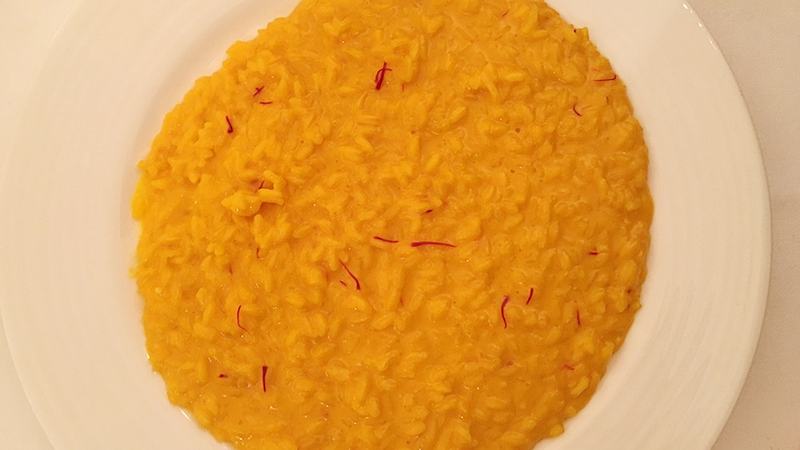 The risotto alla Milanese was rich but not heavy, with concentrated flavors derived not just from the saffron, but also the use of bone marrow to thicken the sauce. The spaghetti with clam sauce was classically perfumed and cooked. 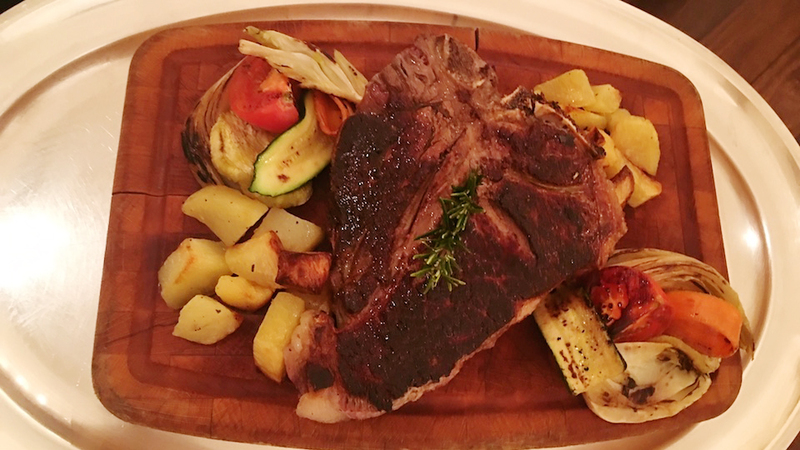 The Fiorentina was large, flavorful and hearty. What needs to improve at Boeucc is the wine service. On my evening here, friendly waiters offered wine suggestions freely and had always something nice to say about each wine ordered, but they clearly weren’t especially expert about wine. Both red wines brought to the table were too warm, and both needed to be chilled down so that they could be enjoyed. This is unacceptable in a fine dining destination of Boeucc’s ilk, and it certainly put a damper on my evening, as I had to wait for the red wine to be drinkable while my dish was sitting before me. In a city with as many fine dining spots as Milan has today, this sort of thing is a real killer, not to mention it being disrespectful of the families that have toiled long and hard to produce the wines in the first place. On a positive, one bottle was clearly marked by cork taint. The waiter didn’t hesitate to change the bottle, although I was halfway through my main courses by the time the second bottle was brought to the table. 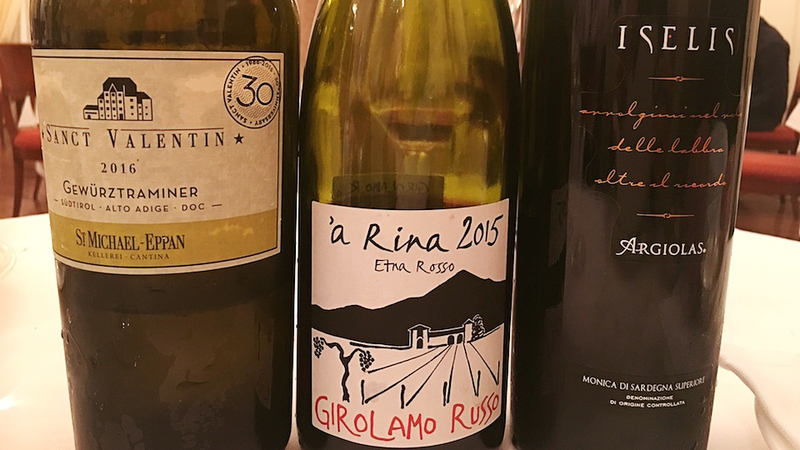 The 2016 Cantina St.Michael-Eppan Gewürztraminer Sanct Valentin is another winner in a long lineup of great Gewürzes from Alto Adige’s San Michele Appiano cooperative (St.Michael-Eppan, in German). Though slightly less concentrated than some memorable older vintages of this wine, the 2016 was nonetheless very precise and focused, delivering the variety’s telltale aromas and flavors of grapefruit, rose petals and spicy tropical fruit in spades. Monica is a little-known Sardinian grape variety (there are actually at least four different Monica varieties growing in the island) that gives fruity, juicy reds somewhat similar in style to good Sangiovese wines. The 2015 Argiolas Monica di Sardegna Iselis was a real looker, with a deep core of red and blue fruit nicely sexed up by hints of oak and spices. This very juicy, medium-bodied red made a wonderful all-round dinner red, though on this evening it matched especially well with the bistecca Fiorentina. Last but not least, the 2015 Girolamo Russo Etna Rosso ‘a Rina was in fine form, with the typically brambly, flinty red berry aromas and flavors both very intense and pure. 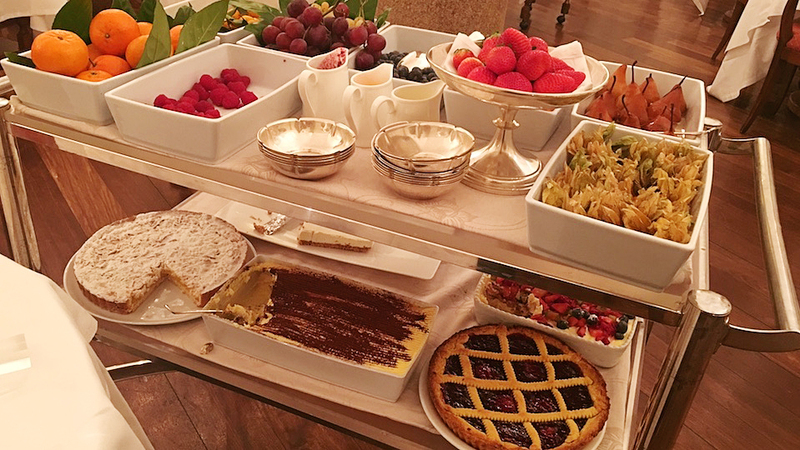 Silky and focused, it lingered nicely on the palate as I waited for the dessert trolley to be rolled by the table. Overall, there are many things to like about Boeucc. The place is beautiful in a refined, old- fashioned way, the food is expertly prepared, and the service is professional but not at all stuffy, even friendly. However, Boeucc’s prices are not especially gentle, and as competition is stiff amongst the city’s dining spots nowadays, Milan’s visitors and restaurant goers have many options to choose from. Boeucc’s owners need to do something about wine storage and service. 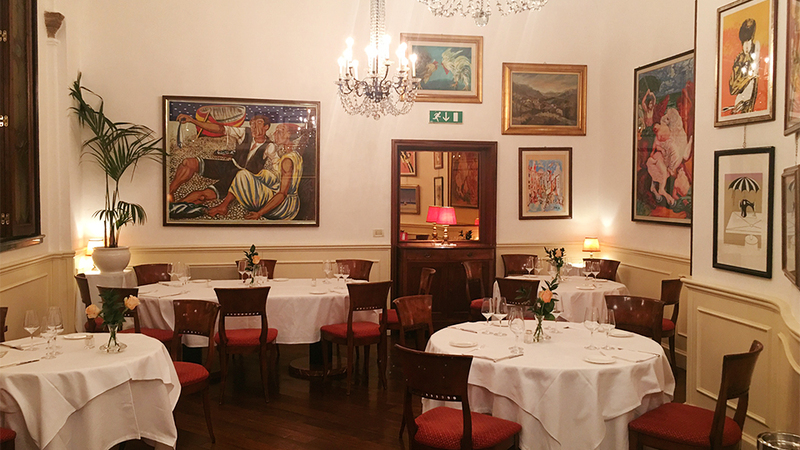 When that happens, wine lovers will have another good dining spot in Milan worth frequenting.